These days, the only employment sector that can be called a sure thing is health care; according to the Bureau of Labor Statistics, the field is expected to add some 2.3 millions jobs by the year 2024. Those are jobs at all skill levels and pay grades, from orderlies, aides, and assistants with a high school diploma, to the highest-paid, most elite surgeons, so obviously some positions will be more competitive than others. Competition is going to be especially fierce within the middle and upper rungs of management, where job candidates have to distinguish themselves. The modern world of 21st century healthcare is a very complicated one, with government, private practice, business, and non-profits all having to cooperate, collaborate, and regulate medical care. Somebody has to be in charge. Healthcare management is increasingly important, as millions of aging Baby Boomers create a significant burden on the system and insurance reform creates more bureaucracy. And right now, there’s a definite shortage of experienced, well-educated managers who can take on the task. Now is the time for working professionals in the healthcare system to go back to school, get the higher degrees necessary to qualify, and do everything they can to stand out from the pool of applicants. There are substantial rewards at hand: by the BLS’s statistics, the top 10% of health managers make more than $150,000 annually. Many – maybe even most – of the people who are considering a master’s degree in healthcare management are looking at online programs. For busy working adults, it makes the most sense: keep your job and connections while earning the credentials to move up. But it can be hard to choose. Value Colleges has put together this comprehensive list of the top 50 Best Values for online healthcare management degrees to guide prospective healthcare industry leaders to the most reliable values in the field. These are the schools that do what they say, and give students a return worth their investment. The most common degree type is the MBA with some sort of concentration or added certificate in healthcare management, although Master of Healthcare Administration comes up as well. Either will do the job. With its location in the heart of the Silicon Forest (the tech sector of Portland), Portland State University has made major growth in the 21st century from a more traditional liberal arts education to become known as one of the most innovative public research institutions in the nation. It would be hard not to be innovative in Portland, with the only urban research campus in the region. Much of PSU’s rising reputation is based on its online degree programs, which have been recognized by U.S. News & World Report as standing among the best. One such program is the School of Business Administration’s Healthcare MBA. This online program is designed specifically for the needs of working adult professionals in the healthcare industry; with online courses and some short residencies, the PSU Healthcare MBA is a part-time, flexible, and extremely affordable way for students with demanding schedules to get to class. With a broad education in all aspects of the healthcare system, the Healthcare MBA is as well-suited to dentists and doctors as to dietitians and chiropractors. At only $368, it’s the best deal from a university that is not only on the way up, but leading the way into the future. One thing is for certain about Midwesterners – when something needs to be done, Midwesterners will find a way. Many large Midwestern states share the same challenge when it comes to higher education – big distances, remote communities, and difficulty getting to a campus. The University of Wisconsin system has met this challenge head-on with some good old-fashioned cooperation by creating the University of Wisconsin MBA Consortium, a group of four UW system colleges banding together to offer online business degrees. The Eau Claire, La Crosse, Oshkosh, and Parkside branches of the UW system collaborate to bring students an online MBA degree program that has been recognized by U.S. News & World Report as among the best in the nation. The Consortium’s innovative team-taught and collaborative online classes are well-designed and unique, with many options for specialization and concentration, including Healthcare Management. Fully online, the MBA program is ideal for working professionals and for those who cannot reach one of the UW campuses. It’s a low-cost investment in one of the best online degrees available. A mid-sized regional research institution, Ball State University has been recognized by U.S. News & World Report as an up-and-coming university. Much of that reputation is owing to their large slate of online degree programs, with more than 60 degrees and certificates and more than 10,000 students taking at least one online course. Ball State began offering online courses in the 1990s, when many schools distrusted online education, and they have built a solid foundation for their programs today. Ball State offers an AACSB-accredited, fully online MBA degree program that has been ranked by USN&WR as one of the best in the region, with a highly credentialed faculty and excellent set of specializations. Ball State is the only college in the region to offer Health Economics, as a part of the fully-online certificate in Health Economics, Policy, and Administration, which can be added to the online MBA for further specialization. Ball State’s extremely low tuition rate – only $394 a credit – ensures that graduates will enter the job market ahead, not in debt. As East Carolina University has grown from a small teacher’s college to a mid-sized public research university, largely as a result of its award-winning nursing and business programs, so too has its reputation. In recent years ECU has made the leap from regional to national rankings, and its online degree programs have attracted attention from U.S. News & World Report, the Princeton Review, and others for their quality and value. The AACSB-accredited College of Business at East Carolina has been one of the biggest beneficiaries of the online boom, with an online MBA consistently ranked as a best value. At a university that has made a strong national reputation on nursing, it should be no surprise that online MBA students can also add a fully online Health Care Management certificate for further specialization; ECU knows the healthcare system like few other schools. ECU’s low tuition makes it a bargain as well, sending well-prepared healthcare leaders into the field without the burden of deep debts. At the turn of the 21st century, the state of Colorado set their sights on developing the University of Colorado Colorado Springs into a top institution, with a major growth initiative including building, program development, and outreach through online programs. It’s paid off – UCCS has been recognized by U.S. News & World Report as one of the top regional colleges in the west, and UCCS’s online presence has really made its mark. The College of Business has especially embraced the possibilities of online education. UCCS had one of the first AACSB-accredited online MBA programs in the world, beginning in 1996, when the Internet came on a free CD rom and was paid by the minute. That’s given them 20 years to build one of the best, most specialized, and most affordable online MBA programs anywhere, including a fully online Health Care Administration emphasis. UCCS’s commitment to quality and low tuition makes it a clear top value. A small, regional institution, West Texas A&M University takes the Texas A&M mission of inclusiveness and access seriously. Part of that commitment can be seen in its student body, which is 40% minority and over half female, including a large proportion of Hispanic and Latino students. Online course offerings also make WTAMU’s education more accessible; WTAMU is steadily building their online programs, which have already been recognized as a best value by U.S. News & World Report for their quality and low price. WTAMU’s online MBA has been particularly singled out for recognition, not only by U.S. News, but by numerous online rankings. The online MBA is designed for working professionals to pursue full-time or part-time; dedicated full-time students can finish in less than 18 months, though 2 years is the average. The Healthcare Management Emphasis requires 9 further credit hours of instruction, and applicants should have at least 2 years of professional experience in a related field. WTAMU’s $352 per credit tuition gives students a top-quality degree without a risky investment. One of the foremost names in online education, Pennsylvania State University has built a reputation that defines distance education for the 21st century with the World Campus. While Penn State offered distance education through the mail since the 19th century, forming the World Campus in 1998 proved to be a game-changer in every way. With more than 120 fully online degrees and certificates, Penn State World Campus has made a Penn State degree more accessible for more people than ever without sacrificing their quality or reputation. The flagship of the University of Massachusetts is headquartered in Amherst, MA, a town that defines what Americans think of as a “college town.” But not everyone can make it to Amherst for a UMass degree, which is why UMass, like Penn State, has invested heavily in building one of the finest online programs in the world. With UMass Online, students all over the world can earn a degree from the top public university in New England. The Isenberg School of Management is one of the most respected business schools in the nation, and their online degree programs have been recognized at the top by U.S. News & World Report. The Isenberg School collaborates with the School of Public Health to develop and offer a focus in Healthcare Administration along with the online MBA; drawing on the expertise of both schools gives students as much knowledge as a dual degree. UMass keeps online tuition relatively low for such a respected degree, making it a peerless value. As a private research university largely focused on professional degree programs like business, healthcare, and applied sciences, Clarkson University has been praised by Forbes and the Princeton Review as one of America’s most entrepreneurial colleges, and cited by U.S. News & World Report as a best value. Clarkson’s graduates have some of the highest salary rates in their class, and their online business degrees are ranked among the best in the nation. Clarkson offers an online Healthcare Administration MBA that compares favorably to many better-known programs. Besides the Healthcare MBA itself, Clarkson offers numerous dual degrees in collaboration with other divisions within the university, including pharmacy, law, and medicine. Full-time professionals need no internship, making the degree fully-online, though students who are not working in the field benefit greatly from Clarkson’s connections when they hit the job market. For only $1100, a bargain for such a quality private education, Clarkson is a solid top-10 value. One of the finest private research universities in New England, Northeastern University calls Boston, MA, home, a city with more colleges than most cities have Starbucks. Even in that environment, Northeastern stands out, especially for its innovative approaches to education, such as its model cooperative education and internship programs. Northeastern’s deep connections to industry and business have long given graduates a strong advantage on the job market. Northeastern’s D’Amore-McKim School of Business is globally respected and nationally renowned, named a top 5 MBA by U.S. News & World report. D’Amore-McKim offers a fully online MBA degree program designed for experienced managers who want to increase their credentials and move into higher leadership positions. Their 50-credit MBA program includes numerous specializations, with Healthcare Management being one of the most in-demand. Whether in Massachusetts or elsewhere, the Northeastern brand is recognized for excellence, a benefit for graduates on-campus or online. The oldest college in the Dakota territory, the University of South Dakota has the difficult task of making higher education available across the large, mostly rural state. As the center of academic life for South Dakota, with the state’s only law school, medical school, and business school, the University of South Dakota has found the best way to make its education accessible in the modern era is through the Internet. USD’s online programs have become known for their quality and affordability. The Beacom School of Business offers an online MBA degree program that includes a Health Services Administration specialization, all fully online, and students who majored in business as undergraduates may already have some required credits. One of the most attractive aspects of USD’s online program is that online students pay the same rate whether they are residents or non-residents, making an online USD degree a nation-wide value. The University of Cincinnati is a crucial part of the city of Cincinnati; as the largest employer in the metropolitan region, UC has a tremendous economic impact. As the university credited with inventing the cooperative model of education – in which students alternate classroom learning with regulated work experience for credit – UC has deep ties with the business and government sectors of Cincinnati and the state of Ohio. All those facts make the University of Cincinnati one of the best places in the Midwest to learn the nitty-gritty of managing a business. UC also offers two options for working professionals in the healthcare industry to earn fully online master’s degrees. UC’s Lindner College of Business offers an online MBA with the option of a Healthcare Administration Concentration certificate, for those more interested in the business of healthcare. Those who specifically want an administrative or managerial role in healthcare facilities and systems may want to choose the online Master of Health Administration program, which also includes a number of optional certifications. Either way, UC’s low tuition all but guarantees a rewarding ROI. George Washington University is an elite private research university in the heart of Washington, DC, where it capitalizes on its proximity to the nation’s capital with strong, productive connections to government, private industry, and non-profit sectors. The GWU School of Business is especially respected, cited over the years by U.S. News & World Report, Forbes, the Economist, and more for their entrepreneurship, networking, and high-quality MBA. That nationally-recognized GWU MBA can be obtained online as well, taught by the same experienced faculty and carrying the same weight on the job market. Busy professionals in the healthcare industry will find the online Healthcare MBA flexible, convenient, and exceptionally rigorous, giving graduates all the grounding they need to progress in their careers and exceed their expectations. The second-oldest public university in the UNC system, after flagship UNC Chapel Hill, Fayetteville State has had a low profile for most of its history. As a proud Historically Black University, Fayetteville State has quietly made a solid liberal arts education available for all people since 1865. Fayetteville State’s profile has begun to rise in recent years, however, as students have discovered the incredible value of their online degree programs. Fayetteville State’s AACSB-accredited online MBA program has gained a lot of notice of late. With small classes, online students get the same kind of attention and support they would get from an on-campus program, and an exceedingly diverse student body means a variety of voices in class. Best of all, Fayetteville State has attracted students with one of the lowest tuition rates imaginable for a program of its quality, making Fayetteville State too good a bargain to pass up. A small, private liberal arts university in the beautiful hills of Connecticut’s Sleeping Giant State Park, Quinnipiac University has been a reliable leader in U.S. News & World Report’s best regional colleges for the north. Quinnipiac is especially known for their media and journalism, as well as housing the most accurate and trusted political polling institute in the region. Since 2001, Quinnipiac has become an online education leader as well, with many acclaimed graduate and undergraduate degree programs fully online. One of the most respected is Quinnipiac’s online MBA program, administered by the School of Business. Quinnipiac’s well-developed online MBA prepares graduates for leadership and administration in all areas of business, with a number of intensive specializations, including the Health Care Management Track. Students in the HCM Track develop managerial skills and learn about the specialized needs of the healthcare system. Quinnipiac’s tuition remains reasonable, considering their reputation and quality. Founded in 1964 to address the need for higher education in the southeast Florida region, Florida Atlantic University has grown into one of the most important public research universities in the state. FAU was originally dedicated to adult students, with only upper division and graduate courses to supply degrees beyond the associate’s, and it remains one of the best choices in the region for working professionals and non-traditional students. As one of the most diverse and socially-mobile universities in the south, FAU also is an agent for social improvement. Considering the student body they have traditionally served, it’s no surprise FAU would build up an impressive slate of online degree programs to make education more easily available for working adults. FAU offers an unusual online Executive Master of Health Administration program for experienced professionals in the healthcare industry. This is a program for managers to make the move to the higher rungs, and it is designed for busy professionals to work around their schedules. For those destined for bigger things, it’s an investment well spent. One of the top 15 U.S. News & World Report regional colleges in the North, Marist College is a small, private Catholic university in Poughkeepsie, NY. In addition to being cited by Kiplinger’s as a best value, Marist also has a reputation as one of the most technologically advanced colleges, thanks to a partnership with IBM dating back to the 1980s, with Marist acting as a testing ground for new educational technology. A strong set of online degree programs would seem to be a natural development for Marist, and Marist has quite a few of them. Marist’s online MBA degrees are especially popular, including the Healthcare MBA, which is fully online and fully accredited by the AACSB. As a Catholic institution, Marist’s Healthcare MBA emphasizes ethics, responsibility, and regulation. At only $780 per credit, Marist is extraordinarily affordable for a college of its type. A private research institution, Drexel University has been dedicated to practical education in professions and applied sciences from the very beginning. Drexel’s adoption of the cooperative model of education (invented at the University of Cincinnati, #12) has defined much of its success; Drexel has productive and rewarding connections within the business community of Philadelphia, and a reputation that turns those connections into careers for Drexel graduates. Drexel’s LeBow College of Business offers an online MBA degree that has been ranked as one of the best in the world by Financial Times, carrying every bit of the reputation that employers expect from Drexel. Drexel’s online MBA is a 2-year cohort program in which students work through the process in teams, developing cooperative skills and connections, and one short residency is required. The Healthcare concentration prepares students for all the political, technological, and economic challenges of modern healthcare, with the Drexel name preparing them for success on a competitive job market. A small, private liberal arts university in Hempstead, NY, Hofstra University is known as one of the most politically engaged campuses in the nation, having hosted a number of significant presidential debates and a series of lectures on contemporary politics. Hofstra is a highly selective, rigorous, and respected institution; this is especially true of the Zarb School of Business, which has been recognized by U.S. News & World Report, the Princeton Review, and Forbes, among others. The Princeton Review has called the Zarb School’s online MBA the #15 best online MBA in the nation, designed for experienced, working adults in professional careers. The Strategic Healthcare Management concentration is an especially intensive, deep-diving education in all aspects of modern healthcare administration, including human resources, law and ethics, and information systems. Graduates from Hofstra’s online MBA can count on a strong showing in their careers thanks to Hofstra’s commitment to excellence. Founded in 1971 by pastor Jerry Falwell, Liberty University was a small, private, evangelical Christian college in the sleepy town of Lynchburg, VA, before establishing the Liberty Online education program in 2009. In just a short period of time, Liberty Online has exploded into a globally-recognized force in online education, with nearly 100,000 students taking online courses, far more than the mid-sized on-campus student body. Christian students are attracted to Liberty’s explicitly evangelical worldview, but many are also attracted to Liberty’s value; Liberty’s per-credit tuition rates are among the lowest online. That includes Liberty’s online MBA in Healthcare Management, which runs only $540 per credit. Liberty’s fully-online, 45 credit MBA program focuses on responsible, ethical leadership integrating Christian values into professional settings, an approach very attractive to Liberty’s ever-growing student body. Located in the historic and much-loved college town of Athens, OH, Ohio University is one of the oldest public universities in the US, founded by an act of Congress to bring education to the Ohio frontier. Praised by U.S. News & World Report, the Princeton Review, the Economist, and many, many more, Ohio University is especially proud of the many competitive awards won by its students and alumni, including a high proportion of Fulbright Scholars. Ohio’s AACSB-accredited School of Business has been praised by U.S. News & World Report and the Princeton Review, and named the #3 MBA value by Fortune Magazine. Students can earn an MBA from Ohio fully online, with a well-developed, carefully-constructed, flexible set of courses that include a 3-course Health Care Concentration. With no GMAT requirement, Ohio’s online MBA is accessible and affordable. Wilmington University is a mid-sized, private liberal arts university in New Castle, DE (a suburb of Wilmington, Delaware’s largest city). Wilmington University is relatively young, founded in 1968, and not particularly well known until recent years, when their online program began growing in reputation and numbers. Today Wilmington offers more than 90 fully-online degrees and certificates, and boasts a student body of over 20,000, many online. Wilmington University’s School of Business offers an online MBA program that is designed for working professionals; short, 7-week intensive courses allow students to work around their own busy schedules. Wilmington’s curriculum is built on diverse business models, with their Health Care Administration concentration focusing on the needs of older Americans, especially insurance and spending policy. With Wilmington’s low cost, it’s a win for Delaware professionals. Like Florida Atlantic (#16), Florida International University is a public institution that was founded as part of a broad plan to beef up Florida’s higher education system. And FIU certainly accomplished that mission; today it is the second-largest university in Florida (making it the fourth-largest in the nation), with a high proportion of valedictorians and a highly diverse campus. FIU’s College of Business is especially well-regarded, a U.S. News & World Report top 10 business school, and one of the most entrepreneurial campuses in the nation. The Chapman Graduate School of Business offers a fully online Healthcare MBA degree designed for professionals in the healthcare system with at least two years of experience. With intensive, fully online courses, full-time students can complete the program in only 18 months and head out on the job market with confidence in the Florida International reputation. The University of Scranton is a private, Catholic institution founded and maintained on Jesuit principles of education and service. Scranton has long been recognized by U.S. News & World Report as one of the top ten regional universities in the north, and an up-and-coming school more recently – not to mention being named one of the friendliest campuses in the nation by the Huffington Post, for what it’s worth. US’s AACSB-accredited Kania School of Management is one of Scranton’s most respected divisions, thanks in part to Scranton’s excellent online MBA, which features small classes, one-on-one support, and Scranton’s award-winning faculty. The online MBA includes a Healthcare Management specialization that combines thorough knowledge of the modern healthcare system with US’s Jesuit values of ethical public service. For a private Catholic college, Scranton’s tuition is low enough to make it a well-known value. Founded in 1968, Mount Vernon Nazarene University is a Church of the Nazarene liberal arts university in Ohio. Located on a beautiful rural campus near Mount Vernon, OH, MVNU is known locally for its lovely Williamsburg, Virginia-inspired architecture, and more broadly for its educational rigor and growing adult education programs. Since 1993, Mount Vernon Nazarene has been building from a traditional liberal arts college to include strong professional offerings, including many online degrees. Mount Vernon Nazarene offers a fully online MBA program designed for adults already working in a professional capacity. The Healthcare Administration concentration is intended for clinical professionals and managerial/administrative workers who have experience in the healthcare field. This 12-course degree program offers generous credit for prior learning and experience, and a low tuition rate makes Mount Vernon Nazarene’s online Healthcare MBA even more of a bargain. The oldest Catholic university in Florida, Saint Leo University went through many changes – including becoming the first racially-integrated school in the Deep South and a stint as a prep school – before finding its calling in 1973, providing distance education for military students. With dozens of branch campuses on and around military bases, Saint Leo became one of the foremost educators for the military, and their online programs only increase their reach. Saint Leo offers a fully online MBA degree program with a concentration in Health Care Management that gives students a full, thorough understanding of all the complications of modern healthcare, from law and ethics to economics and insurance. MBA courses are broken up into 8-week terms, with students taking two courses per term; students may also choose two concentrations at a time, if they wish. Saint Leo’s reputation for online learning and low tuition rates are a godsend for military students, but they’re a value for anyone. Benedictine University, a small Catholic university in the suburbs of Chicago, has long prized practical education with application to bettering human society, in keeping with the Benedictine values of its founders. That includes not only many courses and programs in ethical leadership, but also strong programs in business and healthcare and partnerships with the business and health sectors of Chicago for student employment and internships. As such, Benedictine offers not one but two fully online opportunities for future leaders in the healthcare industry. Students who are inclined toward the business end of healthcare may choose an online MBA in Health Care Administration; those with their sights set on policy and administration on a larger, social level may choose the dual MBA/Master of Public Health program. Either way, Benedictine’s reasonable tuition rates and educational excellence make for a sound online investment. One of the fastest-growing colleges in Texas, the University of Texas at Tyler was a senior college for much of its history, educating transfer students from junior and community colleges in upper-division courses. While it is a 4-year university today, UT Tyler retains its appeal for working adult students, and much of its growth is owing to its online degree programs. UT Tyler features small classes and personal attention like a private university, with public university prices. UT Tyler’s excellent online business degrees are well on the way to establishing Tyler beyond the confines of a regional university. Tyler’s fully-online Healthcare Management MBA is a 36-credit program designed for flexibility and accessibility; students can complete their degree in as little as one year, and usually no more than two. UT Tyler keeps tuition low, giving students throughout Texas an opportunity to enter a much-needed, rewarding career. A private, evangelical Christian institution, Indiana Wesleyan University is the fastest-growing university in Indiana and one of the most successful Christian colleges in the nation, largely due to its investment in adult education and online programs. In less than 20 years IWU has grown from a couple of thousand to over 15,000 students, with the vast majority in online degree programs. IWU is the main competition of Liberty University (#20), and quickly closing in. One of the excellent online programs that has made Indiana Wesleyan’s name is the fully online MBA program, and working professionals in the healthcare industry will find IWU’s Healthcare Administration MBA an attractive option. The program can be completed in as little as 18 months to 2 years, and Indiana Wesleyan’s low tuition ensures that that time will be well-spent and easily returned by a life-long career. A small, Catholic college, DeSales University is widely recognized as one of the top liberal arts colleges in the north. Founded on the principles of St. Francis de Sales, the patron saint of writers who was known for his patient kindness, DeSales emphasizes Christian humanism, applying Catholic faith to all aspects of life to promote peace, learning, and justice. These values are readily apparent in DeSales’ growing online programs just as in their on-campus education, such as in the online MBA. DeSales’ online degrees are taught in three 12-week semesters, and one intensive 6-week summer semester, allowing students the flexibility to work around their existing schedules. The Health Care Systems Management concentration gives students a full 4-course grounding in the modern healthcare system, all for DeSales’ reasonable tuition. A Christian liberal arts institution, Concordia University, St. Paul, is the flagship of the large Concordia University System, an organization of Lutheran colleges. In recent years, Concordia has developed a national reputation for its top-quality online degree programs, which combine Concordia’s Christian liberal arts values with practical, professional education. Concordia maintains its commitment to close personal attention and academic support throughout its online degree programs with its mentoring program, which partners online students with MBA faculty for advice and guidance. Concordia’s online Health Care Management MBA concentration is perfect for busy professionals, with flexible scheduling and strong support. Concordia’s low tuition promises students a significant return. Long ranked as a top-tier regional university in the west by U.S. News & World Report, Regis University is an integral part of the Denver, CO community and an institution dedicated to service, sacrifice, and the common good. Regis has hosted numerous prominent speakers on peace and justice, including Desmond Tutu and Elie Wiesel, and lives up to the values of its namesake St. Francis Regis, who ministered to the homeless and prostitutes in France. Regis’s College of Business and Economics was consolidated from various programs in 2015 to house Regis’s business, management, and economics programs in one division. The College of Business and Economics collaborates with the Rueckert-Hartman College for Health Professions to offer a fully-online MBA in Health Industry Leadership. As a Jesuit college, the Health Industry Leadership MBA emphasizes public service and ethics, combined with analysis, decision-making, and management. It’s an education that could easily cost a fortune, but Regis University’s reasonable tuition makes it affordable for just about any working professional. Oregon’s first liberal arts college for women when it was founded in 1893, Marylhurst University today is a co-ed, private Catholic university. Marylhurst (which poetically means “Mary’s Forest”) is well known throughout the Pacific Northwest as a best value and a top regional university; Marylhurst’s business programs are especially well-regarded, having the largest MBA program in Oregon. While Marylhurst is a Catholic college, most students are not Catholic. Marylhurst has been building their online degree programs since the mid-1990s, and their expertise in the area is well-established. Online Marylhurst students benefit from the same small classes and personal attention as the on-campus students, with knowledgeable professors who are well-trained in distance education techniques. Students can earn a Health Care Management MBA from Marylhurst in 12 intensive 5-week classes, a schedule that allows them to finish quickly and apply their learning to their current positions. A small, private Catholic liberal arts university, the University of St. Francis is built on Franciscan values of respect, compassion, service, and integrity. The University of St. Francis is a highly religious community, and their degree programs and activities are designed around faith, learning, peace, and justice. This is as true in the College of Business & Health Administration as in any other area, as students are prepared for faithful service in the business field rather than pure, amoral money-making. The University of St. Francis’s mission is evident in their MBA degree program, which directs students to ethical service using the tools of strategic management and business. The MBA can be earned fully online, including the Health Care Management concentration, in only 18 months or 2 years. In keeping with the Franciscan commitment to education, tuition is kept at an accessible cost, making the University of St. Francis one of the best values in the Midwest. The largest private university in Minnesota, with over 10,000 students, the University of St. Thomas has campuses in Minneapolis and St. Paul, and may be the most respected and influential school in the region after the University of Minnesota itself. On-campus students get to experience both urban and suburban campuses, each with their own benefits, but St. Thomas’s online degree programs are becoming more popular every year. The Opus College of Business is one of only a handful of AACSB-accredited business schools in the state. St. Thomas offers a Health Care MBA degree program that is not entirely online, but is very flexible; all coursework is online, but students must come for a brief, 3-day residency, and will attend a 3-day residency in Washington, DC to learn about federal healthcare policy-making first-hand. While it may not be as convenient as a 100% online program, the opportunities St. Thomas provides make it one of the best investments available. A small, private university in Chester, PA, Widener University has been a boys’ prep school, a military college, and finally a co-ed university in its long history. Highly respected in the Northeast, Widener has been cited by Washington Monthly for its contributions to social mobility and civic responsibility, and U.S. News & World Report rank it among the top tier of national universities. As a small, rigorous institution, Widener promotes small classes, active mentorship, and strong community. Those values inform Widener’s online programs as well, such as the fully online MBA; online MBA students are prepared for responsible leadership with courses that emphasize the role managers and administrators play in meeting real societal needs. Widener’s online Health Care Management concentration is a 33-credit program, and students with undergraduate degrees in business may waive some foundational credits to complete the program even faster. Previously known as Regents College, Excelsior College is a unique institution in the capital city of Albany, NY. Founded in 1971 by the New York State Board of Regents (the governing body of New York’s private and public education system), Excelsior was designed to meet the growing need for distance education programs in the state. As such, Excelsior is recognized for its flexible course designs, generous acceptance of transfer credits, and military-friendliness. Considering the pedigree, Excelsior’s online degree programs are understandably respected for their quality and affordability – accessible distance education is Excelsior’s whole reason for being. Excelsior offers a fully online MBA program that includes an optional concentration in Health Care Management. Designed for working professionals, the Excelsior Health Care Management MBA is up-to-date and recognized on the job market, a low-cost investment in an in-demand career. In only a few years, Southern New Hampshire University has vaulted from a small, private regional institution to one of the prime names in distance education, with a student body of over 65,000, all but 3,000 of whom are online. SNHU has the distinction of being named one of the most innovative institutions in the world, an their experiments and commitment to online education have transformed the still-young industry. In business alone SNHU offers more than 100 degree and certificate types, making it one of the most productive business schools in the world. Professionals working in the healthcare field are attracted to SNHU’s online Healthcare Management MBA, an intensive, rigorous program that can be completed in as little as 15 months to get graduates on the fast track to career growth. Southern New Hampshire University’s affordable tuition is key to its value. U.S. News & World Report’s #11 best regional institution in the north, Saint Joseph’s University is a Philadelphia landmark and a model Jesuit university. A highly religious institution, Saint Joseph’s curriculum is thoroughly infused with Jesuit values of practical, applied learning and social responsibility. This is especially true of the AACSB-accredited Haub School of Business, one of the highest-ranked business schools in the nation. Saint Joseph’s Haub School offers a unique and innovative online Pharmaceutical and Healthcare Marketing MBA for Executives. Designed specifically for high-ranking managers with substantial experience in the healthcare industry, Saint Joseph’s online program is accelerated and intense, with month-long courses; students can complete the program in just one year, or take up to six. It’s a degree like no other from one of the most respected institutions of its kind. A small Catholic institution, Rivier University emphasizes education for the “whole person,” a holistic approach combining spirituality, personal development, and career preparation. With both traditional and non-traditional students, Rivier’s curriculum focuses on professional studies, with on-campus, online, and hybrid courses for flexibility. Rivier was founded by the Sisters of the Presentation of Mary and Sister Madeleine of Jesus and remains a deeply Catholic institution. To better serve their working professional students, Rivier offers a fully online MBA in Healthcare Administration. The program is 36 credit hours of asynchronous, 7-week courses, led by the Department of Business Administration. With instructors experienced in the field, not just the classroom, Rivier’s business degrees emphasize real-world application and experiential learning, and their low tuition rate gives students assurance that their money and time will be well-spent. A small, regional public university in the beautiful foothills of rural New Hampshire, Plymouth State University best known for their teaching programs, having been founded as a teachers’ college. PSU is also recognized for Community Engagement by the Carnegie Foundation, a reflection of their service ethic. In recent years Plymouth State has extended their offerings and reach with online degree programs. One such program is the MBA in Health Care Management, a fully-online course of study designed to be as accessible to working adults as new college graduates. For professionals who have been in the workforce, cornerstone courses will help get up to speed; these can be waived for students with a business bachelor’s, making the degree even shorter. Plymouth’s low public-university tuition keeps it one of the best deals in New England. A private, Baptist-affiliated institution, Wayland Baptist University is the oldest college in the plains region of Texas and, among other distinctions, the first college in the South to voluntarily integrate, even before Brown v. Board of Education. Wayland Baptist’s commitment to making education available and affordable can be seen in that decision, just as their commitment to personal development and Christian service can be seen in their curriculum. Wayland Baptist has been offering fully online degrees since 2006, gradually earning a solid reputation for quality. The School of Business offers a fully online MBA program with a number of possible concentrations, including Health Care Administration, a program that emphasizes ethical leadership and responsible decision-making for managers. A low tuition rate has certified Wayland Baptist as a best value in a crowding field. As a small, private Baptist institution, Gardner-Webb University has been historically known for its outreach and service, designated (like Plymouth State, #41) by the Carnegie Foundation for Community Engagement. Gardner-Webb has well-established adult degree-completion programs as well as accommodating programs for deaf, blind, and otherwise disabled students. U.S. News & World Report ranks Gardner-Webb among the top 50 regional universities for the south. With their well-known commitment to accessibility, Gardner-Webb’s affordable, quality online degree programs are a natural fit. Gardner-Webb’s Godbold School of Business offers a fully online MBA degree program with a number of concentrations, including a Healthcare Management emphasis. This 36-credit sequence is designed to give a full view of the field, from general knowledge of economics and human behavior, to the specifics of healthcare policy and insurance, all for a price that will leave graduates on solid financial ground. The only Catholic university in North Dakota, the University of Mary is a center of faith and learning for Catholics and non-Catholics alike in the region. While the University of Mary sits on a beautiful rural campus overlooking Bismarck, ND, the university has invested greatly in distance and online education over the last two decades, making an effort to reach the far-flung communities of North Dakota more effectively. In only a decade, the Tharaldson School of Business has begun to gain national notice for its online degree programs. The Business School has gone in for diversification, giving future healthcare administrators a number of degree programs to choose from; the 3-course Healthcare Concentration can be applied to the MBA, MS in Business, Master of Project Management, or Master of Public Health, all available fully online. With so many options, and a low tuition rate, the University of Mary is giving students their money’s worth and more. Southern Adventist University, a small, Seventh-Day Adventist institution located in the suburbs of Chattanooga, TN, has been cited by U.S. News & World Report and the Princeton Review as among the top tier of regional universities in the south. With most of its recruitment in the South, Southern Adventist is known for its educational rigor and conservatism, in keeping with its adherence to Adventist doctrine. Southern Adventist’s School of Business is proud of their ties to the healthcare industry of Chattanooga and close relationship with the School of Nursing, which inform their strong online Healthcare Administration MBA. Students in the Southern Adventist online MBA get a full grounding in management and the healthcare industry, with Southern’s emphasis on faith and service in leadership. A public land-grant institution, the University of Hawaii at Manoa is the heart of research and learning in Hawaii, with the only law and medical schools in the state, as well as the only AACSB-accredited business school, the Shidler College of Business. UH’s highly diverse student body includes many Asian-American and Pacific Islander students, and the university has put a great deal of thought and development into online programs to reach the people of Hawaii, spread out on the state’s many scattered islands. The Shidler College offers an Executive MBA designed for experienced managerial professionals to earn credentials while still working. Their innovative, interactive model has classes broadcast in real-time for students to attend, ask questions, and discuss from their own homes or offices. The Health Care Management track gives health industry professionals a greater understanding of the workings of the field while increasing their managerial skills. It’s an option tailor-made for Hawaiians. Originally an extension campus of Syracuse University, Utica College has been an independent institution for the last two decades, gradually edging toward university status with both undergraduate and graduate degree programs. This small, regional college is best known for its health science and cybersecurity programs. Utica College offers a fully online MBA program designed for flexibility, based around case studies and experiential learning for a realistic career preparation. While the MBA includes several concentration options, considering Utica’s well-known health science programs, the Health Care Management specialization is a logical choice. Praised by U.S. News & World Report as one of the top values in the South, and a top 10 online school, Brenau University is an exceptional institution with an inspiring future. The name, “Brenau,” is an invented word combining German and Latin to translate to the university’s motto, “Gold Refined by Fire,” and Brenau has been bringing out the best in students since its beginning as a college preparatory academy. Brenau’s strongest emphasis in on professional education, especially for adults and non-traditional learners, and that mission is the impetus of Brenau’s online degree programs, which began in 2002. Brenau offers a fully online MBA program that includes an optional certificate in Health Care Management for working adults in the healthcare industry. It’s a low-cost degree from one of the most trusted colleges in the south. Newly upgraded from a college to a university, King University is a small, Presbyterian-affiliated institution in the hills of Bristol, TN. King’s main focus is professional education for working adults, emphasizing industry-current and practical coursework. Year-round online courses, accelerated schedules, and credit transfer all work together to make King one of the best choices for busy, non-traditional students. King University offers a fully online, 36-credit MBA degree program that strives for realism and practical use. With team learning, true-to-life case analysis, group discussion, and other collaborative techniques, King’s online MBA gives students a taste of how leadership works in the 21st century business world. Their Healthcare Management concentration provides entry into the field for a low tuition cost. 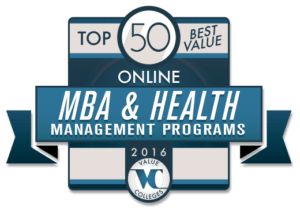 Closing out the Top 50 Best Value Online Healthcare Management Degrees, Maryville University can compete with any institution in its class. A small, Catholic university in the charming St. Louis suburb of Town & Country, Maryville has been praised by Kiplinger’s and Forbes as one of the best values in the Midwest. Since instituting their Weekend College adult learning program back in 1981, Maryville has made providing up-to-date education for working professionals a key part of their mission. Maryville’s online programs perfectly reflect that same dedication. The fully online Maryville MBA is designed to give working professionals skills they can immediately incorporate into their current jobs, and the critical thinking, analysis, and decision-making skills that will allow them to compete and keep pace in the future. Among their ten concentrations, Maryville includes Health Care Practice Management, taught by experienced practitioners to prepare healthcare managers for whatever the future has in store. It’s a model of excellence that is sure to be known nation-wide very soon.